Did you notice the glitter on someone’s body when you were at a vocal concert? It’s actually a very popular fashion element – Lapel Pins. When you want your pin to stand out in the dark, our glow in the dark enamel for custom pins is perfect. Move the lapel pins to a dark place after it is illuminated by normal light, and then the areas with glow-in-the-dark powders will glow in the dark and catch attentions. We have a variety of enamel colors to choose from, so your custom pins can use different colors of enamel to fill in different places, or even use it to fill the entire pin. And more, this particular glow-in-the-dark powders can be applied to both hard enamel and soft enamel pins. First, take a look at the glow in the dark enamel for custom pins comparison between day and night. Next, check out the luminous effect of different glow-in-the-dark powders before choosing the glow in the dark enamel for custom pins. The final color of the enamel pins will be impacted depending upon which glow-in-the-dark powder color we add and how much of it is added. After looking at the picture above, you’re sure to choose a glow in the dark enamel for custom pins for the next big night party. Glow-in-the-dark powders can be applied to both hard enamel and soft enamel pins. We can use different colors of glow-in-the-dark powder to produce the same luminous light, or we can use each color to find the corresponding luminous powder color. 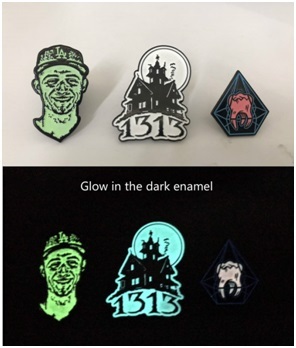 These glow in the dark enamel for custom pins are beautiful in appearance and can be used as the emblem pins, fans pins, commemorative pins, hat pins, etc. As the emblem pins, it plays an irreplaceable role in creating the atmosphere and highlighting the image of the conference. 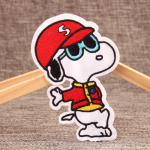 If the glow in the dark enamel for custom pins is designed as the hat pins on the fan’s hat, the effect will be unprecedented when it is combined with the concert. Or make a glow in the dark enamel for custom pins into a horror look for the upcoming Halloween, which will make you become the king of Halloween in the dark.